Just 1.5 km from Saintes Maries de la Mer, the Mas des Colverts is located on a spit of land surrounded by pondswith a wide diversity of birds and ducks within a protected nature reserve. Discover products from Provence and original recipes all based on olive oil, local herbs, Provence seasonings, and spices from across the Mediterranean Basin. 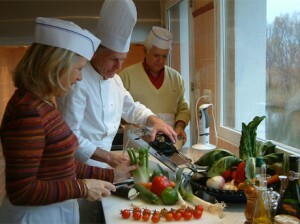 Special cooking classes are held at the Mas des Colverts, in the town of Saintes Maries de la Mer. These sessions are hosted by Roger Merlin, culinary consultant, graduate of the Paris Hotel School and Founder of the Camargue Culinary Conservatory.